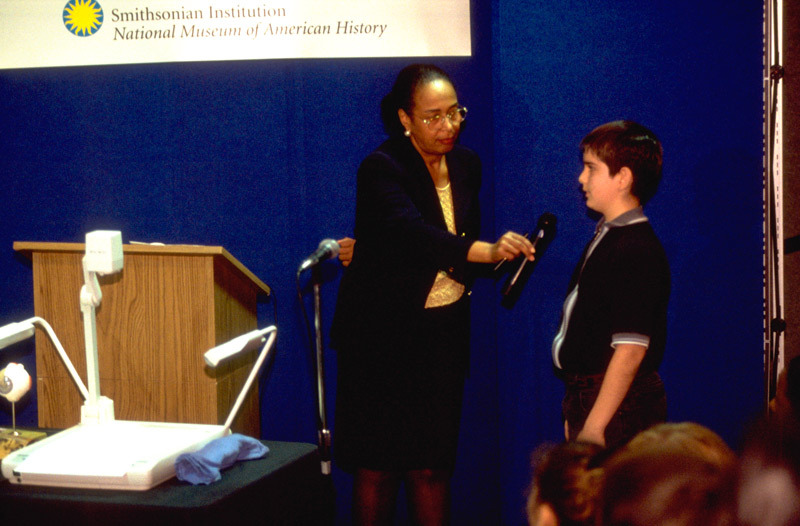 Enabling the blind to see is the greatest joy of Dr. Patricia Bath, eye surgeon, professor of ophthalmology, inventor of the Laserphaco Probe for the treatment of cataracts, and founder of the American Institute for the Prevention of Blindness. An independent thinker, she has been a trailblazer for women and African Americans in the medical profession, being the first to attain many of the highest academic honors and appointments in her field. In March 2000, Bath talked about her life and work with students from three schools as part of the Lemelson Center's Innovative Lives series. Students from Thoreau Middle School in Virginia and Evans Middle School in Washington, D.C., met with her at the National Museum of American History, while classes from the Martin Luther King Elementary School in Los Angeles participated through video conferencing. Bath urged the students to follow their own career interests, to give back to their communities, and to believe in the power of their own ideas. "Believe in the power of truth," she told them. "Do not allow your mind to be imprisoned by majority thinking. Remember that the limits of science are not the limits of imagination." Bath's dedication to a life in humanitarian medicine began in childhood, when she was inspired by learning about Dr. Albert Schweitzer's service to lepers in the Congo. The greatest inspiration in her life, however, was her parents. "Mom and Dad were the fuel and engine of my empowerment," she says. Her father, Rupert Bath, was a well-educated and multifaceted man. An immigrant from Trinidad, he was the first black motorman for the New York City subways, wrote a newspaper column, and worked as a merchant seaman, traveling all over the globe. His stories and mementos of foreign places broadened his daughter's vision of the world and gave her a lifelong yen for travel. Her mother, Gladys, fostered Bath's love of books and encouraged her interest in science by giving her a chemistry set. Gladys Bath, who was descended from African slaves and Cherokee Indians, ensured that Patricia and her older brother, who studied engineering, would have the best education possible. "My mother was a housewife who worked as a domestic after we entered middle school," Bath says. "She scrubbed floors so I could go to medical school." The family lived in Harlem, a New York neighborhood some regarded as impoverished or dangerous. It did not seem that way to Bath: "To me, it was home and a place of happy memories, and I grew up believing I was rich." Her parents gave her a strong set of values that included a love of family above material things, self-reliance, and a hunger for learning. "They believed that with enough education, I could own the world." After attending public school in Harlem, Bath entered New York's Charles Evans Hughes High School. Her first biology course opened a new world. She spent extra hours helping in the lab, was editor of the school's science paper, and won several science awards. In 1959, she was selected for a National Science Foundation summer program for high school students at Yeshiva University. In that program, at the age of 16, she was mentored by Rabbi Moses D. Tendler and Dr. Robert O. Bernard and did innovative work in cancer research that made national headlines. Though inexperienced and shy, she was encouraged to believe in the power of her ideas. By the end of the summer program Bath had collected and analyzed experimental data, developed a hypothesis, and derived a mathematical equation to predict cancer cell growth. Her contributions to Dr. Bernard's research were incorporated into a joint scientific paper presented at an international conference on nutrition in Washington, D.C., in September 1960. The story was reported widely, and Mademoiselle magazine named Bath a winner of the 1960 Merit Award, given annually to 10 young women who make outstanding contributions in their fields and show promise of great achievement. Bath completed high school in two-and-a-half years and went on to study chemistry and physics at Hunter College in New York (B.A., 1964). Her medical training was at Howard University in Washington, D.C. "Going to Howard, a historically black college, was good," she says, "because I had never been exposed to black professors as an undergraduate at Hunter College. It was electrifying and uplifting to be exposed to black people who represented academic excellence, and I had wonderful mentors, Dr. LaSalle D. Leffall, Jr., and Dr. Lois A. Young." While in medical school, she spent one summer on a pediatrics research project in Yugoslavia with a government fellowship. It was her first trip abroad, and the experience strengthened her interest in international issues of health and medicine. The next summer (1968) she served as a medical coordinator for the Poor People's Campaign that marched on Washington, D.C., to demonstrate for economic rights. Bath, whose concern for the disadvantaged and disenfranchised has marked her career, was responsible for the health and sanitary needs of thousands of people in Resurrection City, an encampment near the Lincoln Memorial. With her M.D. degree (1968, with honors) from Howard's College of Medicine, she returned to New York. She was an intern at Harlem Hospital (1968-69) and completed a fellowship in ophthalmology at Columbia University (1969-70). "As a young intern shuttling between Harlem Hospital and Columbia University, I was quick to observe the differences in care based on location," Bath recalls. It seemed that at the Eye Clinic at Harlem Hospital, half the patients were blind or visually impaired. In contrast, at the Eye Clinic at Columbia . . . there were very few obviously blind patients. That observation fueled [a] passion . . . to conduct a retrospective epidemiological study . . . which documented that . . . blindness among blacks was double that [among] whites. I reached the conclusion that the cause for the high prevalence among blacks was due to lack of access to ophthalmic care. This conclusion led me to propose a new discipline, known as Community Ophthalmology, which is now operative worldwide. Community ophthalmology combines aspects of public health, community medicine, and clinical ophthalmology to offer primary eye care to underserved populations. Volunteers trained as eye care workers visit senior centers and daycare programs to test vision and screen for cataracts, glaucoma, and other threatening eye conditions. This outreach has saved the sight of thousands whose problems would otherwise have gone undiagnosed and untreated. By identifying children who need eyeglasses, the volunteers give these children a chance for better success in school. Bath was also instrumental in bringing ophthalmic surgical services to Harlem Hospital's Eye Clinic, which did not perform eye surgery. She persuaded her professors at Columbia to operate on blind patients there for free, and she volunteered as an assistant surgeon. Following her internship, Bath completed her training at New York University (1970-73), where she was the first African American resident in ophthalmology. Bath married and had a daughter, Eraka, who was born in 1972. While motherhood became her priority, she managed to complete postgraduate work in corneal transplantation and keratoprosthesis surgery. In 1974, after completing her fellowship in Corneal and Keratoprosthesis Surgery, Bath and her daughter moved to Los Angeles, where Bath joined the faculty of UCLA and the Charles R. Drew University as assistant professor of surgery and ophthalmology. The following year she became the first woman faculty member in the Department of Ophthalmology at UCLA's Jules Stein Eye Institute. "I was offered an office in the basement next to the lab animals, which I refused. I didn't say it was racist or it was sexist. I said it was inappropriate and succeeded in getting acceptable office space. I decided I was just going to do my work." By 1983, she was the chair of the Ophthalmology Residency Training Program (which she co-founded) at Drew/UCLA, the first woman in the country ever to hold such a position. Her work went beyond the confines of the university. In 1976, Bath and three colleagues founded the American Institute for the Prevention of Blindness (AIPB), an organization whose mission is to protect, preserve, and restore the gift of sight. They have funded it largely through their own contributions and donations of equipment solicited from manufacturers. The AIPB is based on the principle that eyesight is a basic human right and that primary eye care must be made available to all people, everywhere, regardless of their economic status. Much of the work of the AIPB is done through ophthalmic assistants, who are trained in programs at major universities. The Institute also supports global initiatives to provide newborn infants with protective anti-infection eye drops, to ensure that children who are malnourished receive vitamin A supplements essential for vision, and to vaccinate children against diseases (such as measles) that may lead to blindness. As director of the AIPB, Bath has traveled widely, even making an around-the-world trip with her daughter (who is also pursuing a career in medicine) in 1981. On these travels, she has performed surgery, taught new medical techniques, donated equipment, lectured, met with colleagues, and witnessed the contrast in health services available in industrial and developing countries. It was in 1981 also that she first conceived of an invention that would use a laser to remove cataracts, a cloudiness that forms in the lens of an eye, causing blurry or distorted vision, or even blindness. Cataracts generally occur in people over the age of sixty, and nearly anyone who lives long enough will develop them. They are one of the leading causes of blindness. Doctors have treated cataracts with traditional surgery or, more recently, ultrasound, to remove the clouded lens. An artificial lens can then be inserted. But Bath envisioned a way to make the surgery faster, easier, more accurate, and less invasive (with a much smaller incision) by using lasers. Her concept was more advanced than the technology then available, and it took her nearly five years to complete the research and testing needed to apply for a patent. "When I talked to people about it, they said it couldn't be done," she explains. "UCLA did not have the lasers I needed. We don't have a national laser institute. Our laser superiority is mostly weapon/military related." She designed a laser probe but had to go to Berlin, Germany, to test it with the most advanced laser equipment. When she saw that it worked, she was so excited that she didn't want to leave the lab that night. Her U.S. patents are for the apparatus, the concept, and a modification of the device, and she holds patents from Japan, Canada, and five European countries as well. At the beginning of the year 2000, the Laserphaco is in use in Italy, Germany, and India, but is still being tested by the Food and Drug Administration in the United States. Bath expects that it will be approved within a year or two. She plans to use the proceeds from the licensing of her invention to support the work of the AIPB. In 1993, Bath retired from the UCLA Medical Center and was the first woman elected to the Center's honorary medical staff. Since then, she has been an advocate of telemedicine, the use of electronic communication to provide medical services to remote areas where health care is otherwise very limited. She has held positions in telemedicine at Howard University Hospital and at St. George's University in Grenada and served as a consultant to an Internet firm, eBioCare.com. Her greatest passion, however, is fighting blindness. Bath continues to direct the AIPB and hopes one day to establish a new center known as the World Eye Institute, dedicated to the prevention, treatment, and cure of blindness. Her "personal best moment" happened on a humanitarian mission in North Africa, when she restored the sight of a woman who had been blind for thirty years by implanting a keratoprosthesis. "The ability to restore vision is the ultimate reward," she says. While her career has been marked by many "firsts" as a scientist, a woman, and an African American, she looks forward to the day when a person's work will speak for itself. "Hopefully, our society will come to that point. Sometimes I want to say to people, just look at my work. . . . I've had technological obstacles, scientific obstacles, and obstacles being a woman. Yes, I'm interested in equal opportunities, but my battles are in science." Pat. No. 4,7443,60: Apparatus for ablating and removing cataract lenses, issued 17 May 1988. Pat. No. 5,843,071: Method and apparatus for ablating and removing cataract lenses, issued 1 December 1998. Pat. No. 5,919,186: Laser apparatus for surgery of cataractous lenses, issued 6 July 1999. Pat. No. 6,083,192: Pulsed ultrasound method for fragmenting/emulsifying and removing cataractous lenses, issued 4 July 2000.